Today I am back in a showery Dublin having decided to complete the rest of The 100 Corners of Ireland tour probably next summer. I feel a bit guilty having not completed the trip in one go, but it was always at the back of my mind that I would have to do this in two parts. The weather forecast for the coming week is dreadful - especially for Donegal. See screenshot for midday today from the MET Éireann website to left. I could face no more rain, and will complete at a later time. I have so much to remember from all the places I have been. I will be researching for more information about where I have visited, and plan to write this all up with a view to publication. It has been a great adventure so far, but there is still so much to see and do in the Northern half of Ireland. I arrived in galway area friday Night and just had my first ride to connemara area today, no rain, just a few drops, weatherforecast untrustable. I also decided to take a Ferry a few days earlier and will hide for rosslare on friday so i will be back in Switzerland by sunday. I Check some more of connemara The next two days hoping the weather is ok, otherwise i stay in bed :) here in The Hotel watching The olympics. 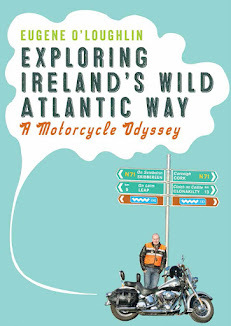 My new book "Exploring Ireland's Wild Atlantic Way: A Motorcycle Odyssey" - is now out! It is about my ride from Kinsale in Cork to Donegal in the north around the coast.